The MTSU Recreation Center is a great place to get your energy flowing and have fun. The Rec is FREE for all students enrolled at MTSU. If you’re feeling stress, or need a break from school then head on over to The Rec. There are many activities that can fit everyone’s interests such as playing basketball with friends, enjoying the pool, walking the track, meeting with the school’s Nutritionist and the list goes on. Exercise and get fit at the Rec. It’s already included in your tuition, so you might as well take advantage of it. Everyone is welcome regardless of your current level of fitness. The cost for bringing in a guest is $5 a day and $2 per fitness class. The hours of operation are located here. The weight room is about 10,000 square feet in full of all kinds of machines and weights for every muscle on your body. One of the best things about going to the Rec is all of the options that they provide. There’s a functional fitness studio that includes weights you can throw on the floor or personal training programs for those who needs a little extra help. Choose your favorite way to burn your calories and get your fitness on with plenty of options. It might be more recreational but ping pong is an Olympic sport, you know. Swing by the ping pong tables behind the weight room and the office is located directly beside it. The office hours are from Monday from 11:30 a.m. to 2:00 p.m., Wednesday 11:00 a.m. to 1:00 p.m., 5:00 p.m. to 6:30p.m. and Thursday from 11:30 a.m. to 1:00 p.m.
Do you need an equipment for your outdoor adventure? The Outdoor Equipment Rental has things ranging from sleeping bags to kayak packages. Take advantage of this perk because the prices are affordable for all students, faculty, staff, and community member. The Manson Pike Trailhead or Thompson Lane Trailhead are some places to kayak in Murfreesboro. Or visit The Duck River, Middle Tennessee’s most popular river for canoeing and kayaking. Prices may vary depending on what kind of equipment, but there is no cost for students to rent small equipment such as sports balls. The O.E.R is open on Monday, Tuesday, Thursday, and Friday from 1:00 p.m. to 6:00 p.m. for bigger equipment rentals. In addition to that, checkouts for small equipment is during the normal Rec hours. 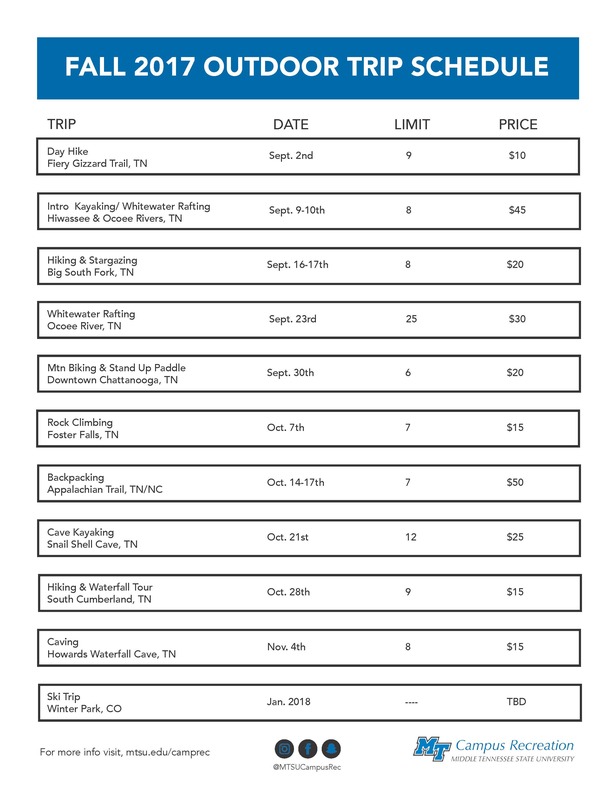 The Middle Tennessee Outdoor Pursuits is a program for anyone who likes to explore nature and adventures. No skills are required for any trip, but the goal is to have fun, make new friends, and stay outdoors. There is something for everyone no matter if you’re a beginner or experienced. The program offers a variety of outdoor trips from hiking and stargazing, mountain biking and stand-up paddling and more. Walking across campus to the next class can be exhausting sometimes. There is a Bike Shop in the O.E.R. where bikes are available to rent. The Bike shop program sells rental cards for $35 a semester for a five day period. These cards allow the owner to choose any of the 30 commuter bicycles to rent along with a helmet and lock. The shop offers repair for personal bikes and hosts free workshops every semester. They can help with any bike related question as well as providing lessons on how to ride safe around campus. Intramural sports has something to offer for everyone whether you’re a student, faculty or staff. If you don’t want to play on a college team or the sport you want to play in doesn’t exist, find or create an intramural league on campus. This is a good opportunity for anyone to play a sport for fun. There are over 50 intramural activities throughout the year. You can build your own teams or you can sign up as an individual player. A fee is required to participate either per year, semester or per sport. Sign up and become an intramural champ. Aquatic recreation offers a variety of activities at the indoor and outdoor pools. The indoor pool is 36 x 25 yards with a depth range from 3.5 to 13 feet. For extra fun, the indoor pool includes a 90-foot water slide and a one-meter diving board. The outdoor pool is zero-entry with a depth of five feet. People from all ages are welcome to join swim, fitness or skills development classes. There’s even a Swim across Tennessee for participants who can swim for many miles. One of the skills class is called Fast Break and its intensity training to burn some body fat. Swimming is one of the best exercise for fast results for your body. The class takes place in the indoor pool on Tuesdays and Thursdays from 12:00p.m. to 12:30 p.m. The cost is $3 per class or $24 for four weeks. For more pool hours click here. The Campus Pharmacy is convenient for everyone around MTSU. It has every drugstore essential available for all purposes. The pharmacy hours are open Monday through Thursday from 8:00 a.m. to 4:30 p.m. and Friday 8:00 a.m. to 4:00 p.m. A student ID and insurance card is needed for this process. Transfer prescriptions are available – and at no charge. Another great perk is having access to a nutrition mentor. The nutrition mentor program helps educate students and faculty on their overall campus health. This is a good reference for anyone who is seeking to build a new healthy habit. Or you can stop by to see another Nutritionist in the office of the Health Services inside. It is located on the right side of the inside entrance. Nutrition classes are available for anyone on Tuesdays through Wednesdays in the upstairs conference room at 5:30 p.m. There’s no cost, and you can’t say no to free stuff. To read or learn more about the Campus Rec Center, click here.